Courtesy of Vasanti Niemz, Sri Chinmoy Marathon Team, Switzerland. 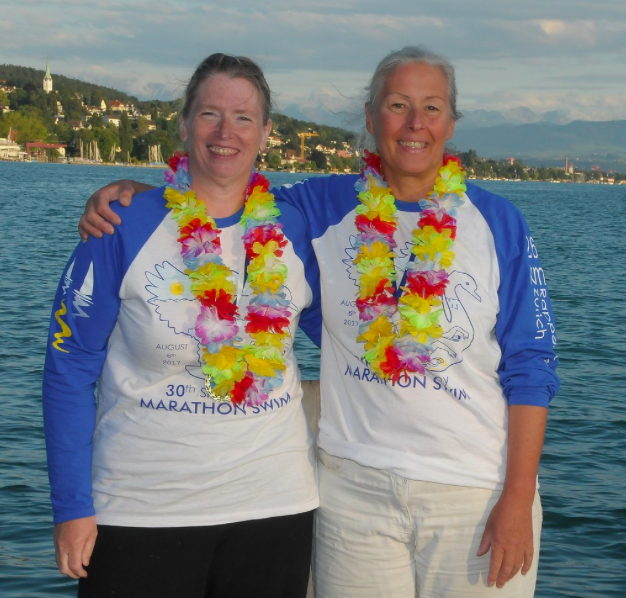 The Sri Chinmoy Marathon Swim (International Self-Transcendence Marathon-Schwimmen) in Switzerland's Lake Zürich celebrated its 30th edition on August 6th. 91 swimmers from 17 countries challenged themselves to the 26.4 km course, either as a soloist or relay team member. Vasanti Niemz reports, "A family from Denmgad, a village in Hampshire, England, trained at the Havant + Waterlodville Swimming Club, wrote swimming history this weekend, when it crossed the finish line as the winning team in the non-wetsuit category in 7 hours 24 minutes. Father John inspired his 15-year-old son Ben and his 19-year-old son Jack to compete with him. The fastest solo swimmers among the 39 competitors were Rumanian Paul Eugen Dorin Georgescu [shown above] who won in 7 hours 11 minutes and Jenny Zwijnen [shown on left], a British mother of twins from Crewe, Great Britain, with a time of 7 hours 44 minutes. Swimming families have a tradition at the event. Aunt Katharina, nephew Gion Braun from Switzerland finished the swim in 9 hours 37 minutes and a team consisting of a brother Mark Button, sister Juliet Flamand, husband Philippe Flamand finished 4th (wetsuit division) in 8 hours 21 minutes. The oldest participant in the race was the 78-year-old American Ralph Brott who finished in a duo team in 10 hours 8 minutes. The race has been organized annually since 1987 by the Sri Chinmoy Marathon Team and was inspired by meditation master and peace philosopher Sri Chinmoy (1931-2007)." Since 2002 the main organizers are Pradeepta Bürgisser and Vallabha René Kaul. 60-year-old Vasanti Niemz completed her 8th career Sri Chinmoy Marathon Swim, finishing third in the masters women's bioprene division. She described the conditions, "The forecast was for thunderstorms and lightning – but at the end, the weather behaved very nicely for the swimmers from Ukraine, Czech Republic, Poland, Romania, Hungary, Canada, USA, Australia, France, Great Britain, Ireland, Austria, Germany, Switzerland, Italy, and Spain. Only one time in 30 years has the swimming distance been shortened due to conditions (strong winds at the start), but right from the start at 7 am from the lido in Rapperswil, the atmosphere on the lake was extremely peaceful with calm waters most of the way, except for the choppier last 3 km and much less boat traffic than usual, probably due to the bad weather forecast and overcast skies with some rain later on. The water temperature was a nice 22°C even where the ferries at the halfway point in Meilen churned up the water, only going down a little in the second half. But then the air warmed up from 18°C in the morning to 23°C around noon, and the currents after a few days of rainfall seemed to help the swimmers, plus some southerly winds towards the end. Even cloudy skies most of the way prevented sunburns." 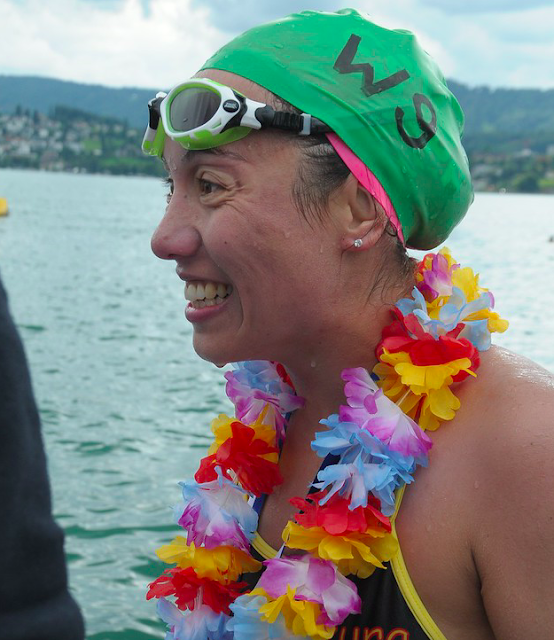 Of the 39 solo starters including all bioprene and neoprene swimmers, 36 finished successfully including Emma France [shown above with Vasanti Niemz] and Sakura Adams [shown below] who brought her newly born baby with her and her husband Nick Adams, competing only a few months after giving birth. "A special guest was ultra marathon runner-turned-Ironman triathlete-turned-marathon swimmer Stutisheel Lebedev from the Sri Chinmoy Marathon Team in the wetsuit category, becoming the first Ukranian to finish in 9 hours 53 minutes." Niemz continued on, explaining how the 26.4 lake swim came into being. "Back in 1986, after the first two successful English Channel swims by members of the Sri Chinmoy Marathon Team in 1985, a number of teammates failed at the English Channel among them Praphulla Nocker. 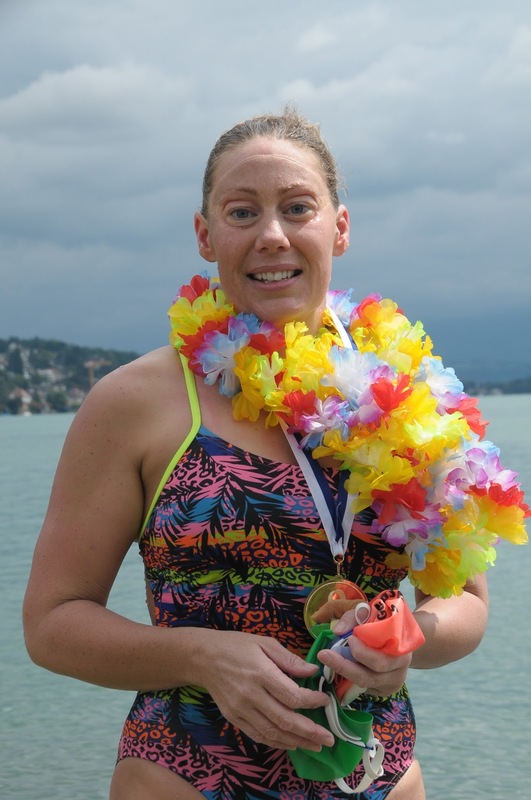 Deeply disappointed, she went back to Zürich and decided to swim the length of Lake Zürich instead. Arriving at the other end she was still not exhausted, so she decided to turn back. The idea to organise this swim for the public, followed inspired by Sri Chinmoy and supported by her Swiss teammates, the new Rapperswil-Zurich Lake Marathon swim was founded in 1987 – after the Swiss company Bio-Strath had organized a marathon race with 9 swimmers back in 1969 for the first time. Over the course of the history of the race, marathon swimming luminaries like Alison Streeter, Michael Reed, Christopher Wandratsch, Susie Maroney, Mohammed Marouf (1993), Sally Minty-Gravett, Lyndon Dunsbee and Bridget Young (1987), Tammy van Wisse (1990), John van Wisse (1992), Chris Stockdale (1993), Karteek Clarke (1998), Cliff Golding and Beat Knechtle (2003), Jane Murphy (2007), Ned Denison, Mark Bayliss and Jim Boucher (2008), Sylvain Estadieu (2009), Bruno Dobelmann (2009), Anna-Carin Nordin (2011), Bruno Baumgartner (2012), Andre Wiersig, Roger Finch, Barbara Held (USA) and Patti Bauernfeind (2013), Nathalie Pohl and Graeme Schlachter /Zimhippo (2014), Andreas Fath and Margit Bohnhof (2015) have completed the Zürich lake swim. For swimmers around the world, it has become a great training swim in preparation of the English Channel. In the early years, the swim was particularly popular with the Indian community, until in 2002 we decided to apply English Channel rules requiring a minimum age of 16 years to enter for safety reasons. Participation is limited by the number of boats available on Lake Zürich. Swimmers bringing their own kayak and helpers are always welcome." Relay results are posted here.